If you are looking for the modern RuneScape guide for this content, please see our Dream Mentor guide. In this quest, you must help a fellow adventurer that doesn't do so well against these threats. With perseverence and the magical help of the Moon Clan, there should be no monster that can't be beaten. Talk to the Fallen Man through the small cave inside the Lunar Isle Mines. Head to Lunar Isle, and enter the dungeon in the north of the island. Once in the dungeon, head south, and to the east of you will be a cave entrance that you can crawl through. Crawl through and talk to the Fallen Man. Note that while you are in the cave with the man, any items you leave probably won't remain when you return. You will view a cut-scene, and the fact that he is not well will become clear. He has torn clothes, cuts and bruises. He certainly has a pulse, and is breathing weakly, however a closer inspection is required. 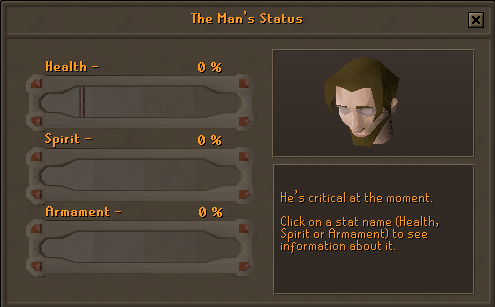 At the end of the cut-scene a screen will come up showing the stats of the man. 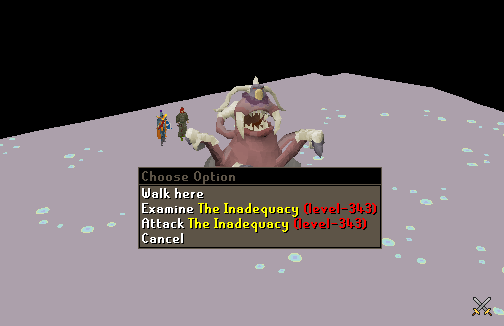 To view this screen at any other time, choose to 'Inspect' him. First of all you need to feed him a variety of food. To do this get at least 3 different foods, and feed him 4 pieces by using them with him. The most efficient way of doing this is getting 3 different foods and feeding Food 1 then Food 2 then Food 3, then repeating the loop again. Whether it is a Monkfish or a Salmon, each one will increase his Health by 5%. After 4 pieces of food have been fed to him, so he has 20% Health, he will open his eyes and you can start to talk to him. Since he is clearly feeling bad in the condition he is in, you will need to tell him positive things such as "Just don't worry". Once you have talked to him positively 4 times he will have 32% Spirit - 8% per time. Now that his spirit is better, an appetite has returned, and you will need to feed another 4 pieces of food so that his Health rises to 40%. At this point a cut-scene will appear, but he will still be in pain. Feed him 6 more pieces of food, making his Health 70%, and positively talk to him 5 more times, making his Spirit 72%. 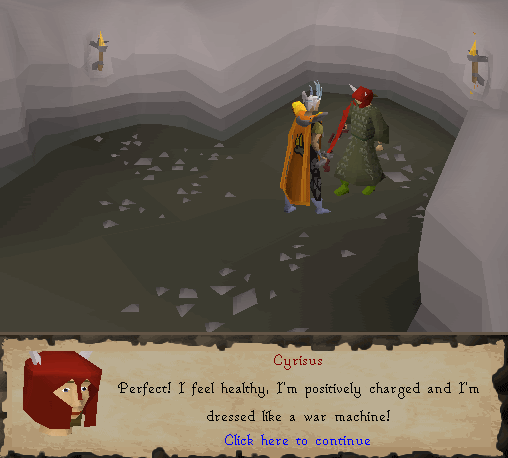 This will make him feel good enough to talk to you, and will tell you to go to the Bank to get some Armour for him. From now on you will also be able to talk to him via the NPC Contact Lunar Spell. Head to the Lunar Isle Bank and talk to 'Bird's-Eye' Jack, seen in the past as the navigator on the ship during Lunar Diplomacy. 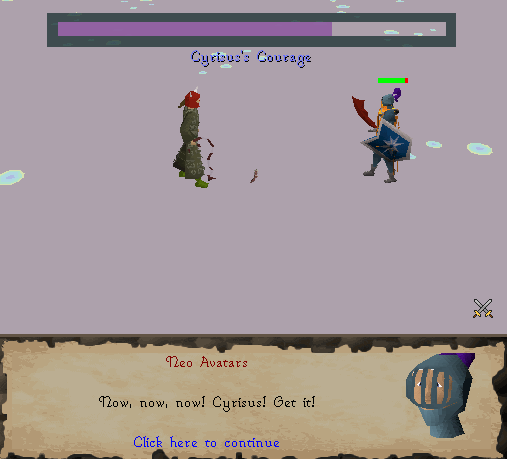 After arguing about why the boat went round in circles on the first attempt to get the Lunar Isle, you will be allowed to see Cyrisus's Bank, and given a Chest to store the Armour in. 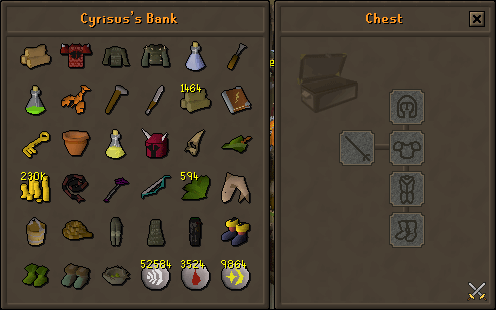 Take the Chest with these 5 Items in to Cyrisus and he will change into them. While doing this, the screen will become black. Now that his Armament is at 100%, it's just Health and Spirit that are low. Feed him 6 more pieces of food, and speak positively to him 4 more times to get both of these up to 100%. Another cut-scene will play. Although he may be dressed like that, it doesn't mean that he's ready to fight. 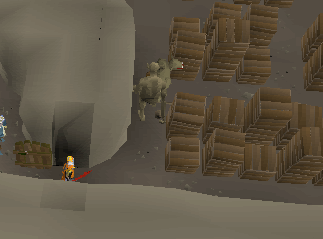 He's traveled from the frozen wastes in the Wilderness to the pyramids of the Kharidian Desert. 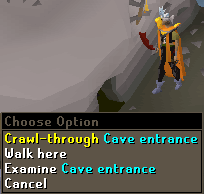 He's lived with the monkeys on Ape Atoll and dined with the TzHaar under the volcano of Karamja but...he's afraid of combat! He will tell you to go to the Oneiromancer, and he will meet you there. Head to the Oneiromancer, found in the southern part of Lunar Isle near to the Astral Altar and talk to her, choosing to talk about 'Cyrisus'. Part way through the conversation he will appear next to you. It is clear that he needs to try and conquer his fear of combat, and to do this you will need to enter Dreamland with him, and to enter Dreamland you will need a Dream Potion. To make this you will need a Dream Vial, Goutweed and Ground Astral Rune. The Oneiromancer will give you a Dream Vial, but then you'll have to find the other ingredients. Take the Vial to a water source, such as a sink, and fill it with water. To get Ground Astral Rune, use a Hammer on an Astral Rune to get Astral Rune Shards. Next use these shards with a Pestle and Mortar to get Ground Astral Rune. You will need to get the Goutweed in the same way as during the Eadgar's Ruse Quest. Enter the Troll Stronghold, and head south. Go down some stairs, and head north-east so that you can head down some more stairs so that you are in a passageway that heads north. Go along this passage, and through the gates, waiting before you enter the room with the Guards. 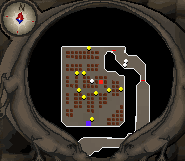 To get across the room to the Goutweed in 2 steps, wait until the two guards nearest to you are in a similar way to the picture above, then run to the red square on the map below. The Goutweed is found in a crate where the Blue square is on the map, so wait until the guard between the safespot and the crate is facing the wrong way, and run to the crate, taking a Goutweed in the process. Use this with the Dream Vial (water), then add the Ground Astral Rune to get a Dream Potion. Now that you have the Potion, you need to get ready for battle! You will be fighting level 343, 223, 274 and 108 monsters one after the other without the ability to use Prayer, so make sure you equip good equipment, and have food ready for a difficult battle. 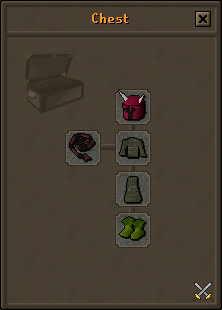 Armour such as Rune with stat-boosting Gloves, Cape and Boots along with a Dragon weapon or Whip should be enough if you have food worthy of a proper meal. Another way that would work well, if you have a high enough level, is Ranging the monsters with a high level bow such as a Crystal Bow - along with Black Dragonhide Armour. The problem here is that if you lose the Crystal Bow, it either costs a large amount to get back or is hard to find a seller to get a new one. 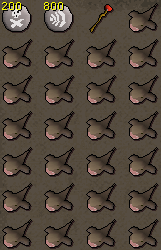 The Tinderbox and Seal of Passage could be banked if you wish to do so to get extra inventory space. The Potion is also given to Cyrisus, so that space could be used for food too. Rings of Recoil are helpful since they will hit damage on the enemy when they damage you. Monkfish, Sharks or Tuna Potatoes are recommended since they heal high amounts of health in a single bite with no side-effects, and are relatively easy to obtain. The level 223 and 274 monsters will only use Melee, and are weak to Magic attacks. This means that as long as you keep out of the way of it by running away when it comes near, Magic is an effective way to kill them without using more than a couple of pieces of food. Remember to take off metal amour though since it lowers your chance of hitting, and as long as you keep running, you won't be within Melee distance of the monsters. Another food item that may help if you need slightly more food than you could otherwise carry is the Saradomin Brew. They heal large amounts with each dose drunk, along with raising your Defense although do lower your Attack, Strength, Magic and Range. If you just have a few of these to drink during the battle to supplement ordinary food there shouldn't be huge problems with the stat lowering too much although taking Super Attack and Strength (if Meleeing)/Range (if Ranging) Potions into the battle with you would be highly recommended. Once you're ready with equipment to fight with, you're ready to attempt the battle. Before entering, topping up your stats by drinking a Super Set/dose of Range Potion will help you with boosted stats, yet it will be possible to Bank them, leaving you with plenty of room for food. With Food, Weapons, Armour, a Tinderbox and the Dream Potion, head to the Brazier located in the large building to the west of the Lunar Isle Bank. Light the Brazier with the Tinderbox - this can now be banked for another piece of food if you wish to do so, and talk to Cyrisus. You will give him the Dream Potion, and be given a last chance before entering the battle to change equipment. This may be when you choose to drink Potions before entering the battle, and get another piece of food to go in the space the Potion was in. To leave the battle part way through you will not be able to teleport since it is within a dream. Instead you'll have to choose to leave with the option on the lectern found near the edge of the arena. If you do have to do this during the first or second fight, don't leave it until you only have one piece of food, or less, left since you may suddenly get hit hard by a couple of Range attacks while running without noticing, and not make it. Having fairly high Hitpoints (40+) when making a run for the Lectern is also a good idea. Upon entering the Dream, a cut-scene will show and it will be clear that the fear of combat is huge, with a level 343 monster appearing. It will use a combination of Melee and Range along with summoning level 78 monsters. Due to these lower level monsters you should turn 'Auto-Retaliate' off so you don't attack them after eating, and can focus on the level 343. This first creature is the most deadly, so don't be surprised if you have to leave and try again once or twice - there will be no need to make a new Dream Potion upon your return so you will just need to re-stock on food and try again. Once the first creature has been killed, another monster will come, this time level 223. It is a much easier fight with only the one, lower level, monster to kill. 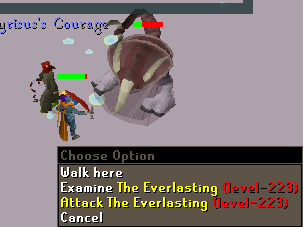 Once it is dead, a level 274 will appear that you must kill! It's slightly more deadly than the level 223, but as long as you have a few pieces of food shouldn't be a huge worry. Just one more monster after the level 274, this time it's level 108. It will keep appearing, then disappearing again by crawling into a hole it makes, then popping up nearby. While it is visible, it is an Agile monster, so you will have to choose to attack for each and every hit until it is just about dead. 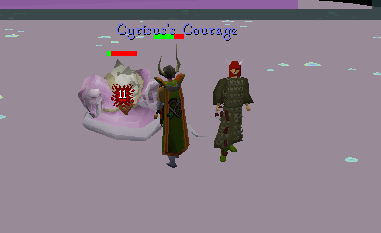 At this point Cyrisus will have enough courage to be able to step into battle and kill it himself. With a mighty stamp on the monster, he manages to kill it, and get rid of his fear of combat! Head back to the Oneiromancer to collect your reward. [^] Talk to the Fallen Man in the Lunar Isle Mines. [^] Feed him 4 pieces of Food. [^] Positively speak to him 4 times. [^] Feed him 6 pieces of Food. [^] Positively speak to him 5 times. 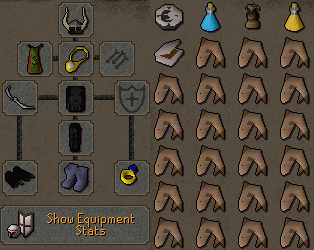 [^] Get Dragon Med, Ahrim's Top and Bottom, Whip and Ranger Boots from 'Bird's-Eye' Jack in Lunar Isle Bank. [^] Take them to Cyrisus. 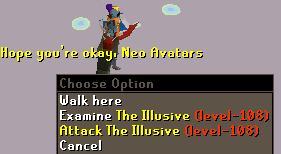 [^] Talk to the Oneiromancer near the Astral Altar. [^] Fill the Dream Vial with water. [^] Crush an Astral Rune with a Hammer, then a Pestle & Mortar, then add to Vial. 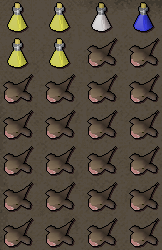 [^] Get some Goutweed from the Troll Stronghold storeroom and add to Vial. 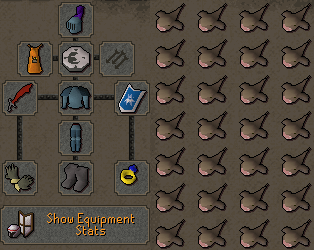 [^] Get equipment to kill level 343, 223, 274 and 108 monsters in a row without Prayer. [^] Light the Brazier in the Lunar Isle Ceremonial Hall. [^] Talk to Cyrisus to give him the Potion. [^] Head back to the Oneiromancer.